Samsung make, in my experience, some of the most efficient netbooks and laptops in the market. Over the last 5 years I’ve repeatedly seen idle / background drain figures that are better than anything else which is why I’m looking forward to testing the Samsung TX100 when it launches. Based on Intel’s Oaktrail it should be capable of some extremely low power drain and as a travel PC for use with solar or other alternative energy sources, nicely positioned. 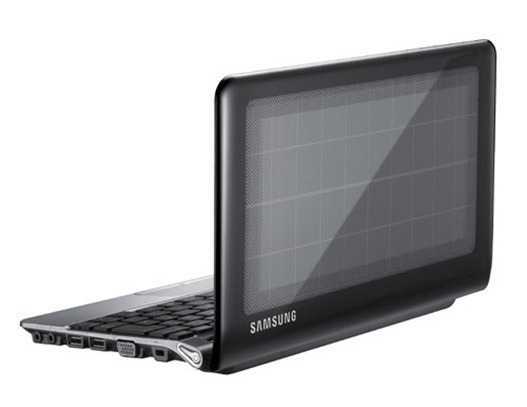 There’s another Samsung netbook out there though that has taken the alternative energy idea one step further. Meet the NC215S with integrated solar panel. The NC215S is for African, Turkish, Slovakian, Russian and other markets initially and although there’s no indication of the size of the power of the panel, I would put it at a maximum 4W which, given a 75% charge efficiency, would be enough to meet the claim that 2 hours in the sun can provide one hour of operation. These devices operate in about 8-10W of power. Update: This is coming to the US market too for a suggested retail price of $399. Liliputing have the details. It’s interesting that Samsung have chosen to go with an Intel platform (N455 or N570 Atom)with rotating hard drive and traditional LED-backlit screen for this because there are certainly better Intel platforms and better storage and screen technologies that could be used. I wonder whether this is mainly a play for a low-emissions computing vote. Still, it’s a start and it means that at least one major computer manufacturer isn’t scared to take a risk with a new design and, come Oaktrail, this could be improved very easily. One thing I couldn’t understand is that the solar panel only give a 4 Watts to recharge the battery, but Samsung claimed that it would be enough to power the notebook which need 8-10 Watts power for 2 hours. What if the battery is completely drained? That 4W couldn’t power the notebook, and maybe it will take hours to charge the battery up. Howz about making the cover detachable so the PV panel can be in the sunlight and you can be in the cool shade. The only thing the current small panel could do is extend the battery life, not power this thing. Your solar panel needs to be a lot bigger to power this baby.